Three in a line at the final flight in the Grade One Challow Novices' Hurdle at Newbury. The winner was Champ (right), from Getaway Trump (nearside) and Kateson (centre). A feast of racing there might have been during the holiday fortnight, but those who attempted to bank enough dosh to offset the Christmas expenses were knocked off course by an upset at virtually every turn. Lostintranslation, ridden by Robbie Power, leads Defi Du Seuil, on his way to victory in the Grade Two Dipper Novices' Chase at Cheltenham on New Year's Day. The number of fancied horses who bit the dust at the main meetings was extraordinary and, in many cases, left the markets for the upcoming Cheltenham Festival in a confused state of disarray. At least 16 horses that went into Christmas expected to make a big impact at the Festival in mid-March were turned over either in the UK or in Ireland, many at skinny odds. What now for the likes of beaten favourites BUVEUR D’AIR (1-4), GETABIRD (8/15), KALASHNIKOV (4/6), ADJALI (4/6), ANNAMIX (4/6), STORMY IRELAND (4/6), LIMINI (8/11), I CAN’T EXPLAIN (5-6), FOOTPAD (evens), SANTINI (11/10), SAMCRO (6/4), WHOLESTONE (6/4), MENGLI KHAN (7/4), ON THE BLIND SIDE (9/4), ROAD TO RESPECT (9/4) and MIGHT BITE (3/1)? One thing is for sure -- relying on form and reputations from last season, most of which took place on testing ground, is not standing anyone in good stead on much better, quicker going this term. Rising star Midnight Shadow (left), ridden by Danny Cook, on his way to a career-best win in the Grade Two Dornan Engineering Relkeel Hurdle at Cheltenham on New Year's Day. An under-rated two-day meeting was quickly brought to life by the emergence of two serious contenders for Festival novice races. It was hugely significant that Nicky Henderson pitched his steely-grey recruit from Ireland, ANGELS BREATH, into a Grade Two for his UK debut. What’s more, he was heavily backed, and he duly justified all the faith pinned on him with a towering performance that points him towards the Supreme Novices’ Hurdle. Half an hour later, VINNDICATION cemented his reputation as an RSA Novices’ Chase candidate by extending his unbeaten run to six for Kim Bailey. He will always need some dig in the ground to be seen at his best, but is an honest galloper and jumper impossible not to like. Jockey Barry Geraghty celebrates the Challow Hurdle victory at Newbury of Champ with Archie, the son of AP McCoy, after whom the horse is named. The action the following day was erratic, making it hard to put your finger on the reason for the sudden return to form of certain horses, and even harder to explain some apparently easy wins. The most competitive Long Walk Hurdle for many years threw up a host of disappointments, helping the improving PAISLEY PARK make his undeniable stamina count and provide the first Grade One success of their careers for trainer Emma Lavelle and jockey Aidan Coleman. While the horse to take from an equally competitive 2m Betfair Exchange Handicap Hurdle was Alan King’s progressive 4yo LISP, who turned in a career best effort and looks worth following. I spent so much time scratching my head and changing my mind over the 32Red King George VI Chase that, in the end, I opted for no bet. The race was littered with top-class horses, but ifs and buts were attached to all, so perhaps it should be no surprise that it fell the way of the one contender still arguably on the up, CLAN DES OBEAUX, who gave trainer Paul Nicholls his tenth triumph in the great race. Whether his win owed as much to his own talent as to the limitations of his rivals remains open to conjecture. Two of those rivals took an early tumble, at least two others were well below par and the no-holds-barred duel in last season’s Gold Cup between NATIVE RIVER and MIGHT BITE has clearly taken its toll on the pair. 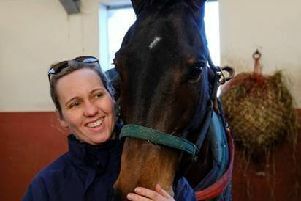 The former was being chivvied along virtually from flagfall, while there must be a serious danger that the decision to run Might Bite again so soon after Cheltenham last spring, at Aintree, could have bottomed him. One other painful lesson to be heeded from the race is that the unlucky exit of WAITING PATIENTLY exposed the sheer folly of wrapping a good horse in too much cotton wool. Since his superb Grade One win at Ascot way back last February, unravelling the world at his feet, Ruth Jefferson’s star has jumped just eight fences in public. On a Boxing Day of magnificent action at Kempton which ridiculed plans to close the course, the other major talking point was the demise of Champion Hurdle favourite BUVEUR D’AIR, who suffered his first defeat, in the Christmas Hurdle, since bowing to mighty stablemate Altior in the Supreme of 2016. His short-head eclipse by another stablemate, VERDANA BLUE, set the tongues of conspiracy theorists wagging like fury on Twitter. I even read that the grey mare’s pilot, Nico De Boinville, had tried his hardest to get beat to avoid embarrassment for the champion! Needless to say, the combined conditions of flat track, Good ground and a fast pace, proved ideal for the winner, who is a talented animal in her own right, whereas they failed to bring out the best in Buveur D’Air. JP McManus’s 8yo didn’t jump as fluently as usual either, and almost certainly got to the front too soon, but the upside is that he has now drifted to a backable price of about 6/4 for the big one. Aso, ridden by Charlie Deutsch, gallops to victory in the Grade Three 2m4f handicap chase at Cheltenham on New Year's Day. Henderson had to endure another unexpected setback with the defeat of SANTINI, loudly hailed as his next RSA and Gold Cup horse. But the imposing 7yo arguably enhanced his reputation by running on strongly in a Kauto Star Novices’ Chase that was not a sufficient stamina test for him. Mind you, the two who beat him, LA BAGUE AU ROI and TOPOFTHEGAME, hardly dented their RSA reputations either. Festival dreams were also fuelled by the victories of Henderson’s MISTER FISHER in the opening novices’ hurdle, although he was receiving weight from his victims, and by novice chaser GLEN FORSA, who will now try and emulate the success of Mister Whitaker in last year’s Close Brothers Handicap for the same connections. 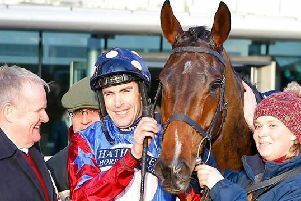 Cheltenham clues were not so abundant on the second day of Kempton’s meeting, but the KALASHNIKOV bubble, so heartily blown by sections of the racing media, was well and truly burst in the 2m novices’ chase. Just as Lalor was at Sandown three weeks earlier, Amy Murphy’s charge was put in his place by DYNAMITE DOLLARS, yet another example of the skills of Paul Nicholls. Just 12 months earlier, this 6yo was trailing in 32 lengths behind the winner in a run-of-the-mill handicap hurdle at Newbury off a mark of just 133. Now he is the form choice for the Arkle at the Festival. Meanwhile, a former Arkle winner, ALTIOR, reeled off his 16th straight success as a 1-8 favourite in the Desert Orchid Chase. No doubt the race fitted neatly into the pre-Cheltenham schedule of the 2m champion, but it would be gratifying to see him presented with a few more exacting challenges than an ordinary Grade Two contest in future. The Jumps season in Ireland so far has been noticeably hamstrung by a shortage of rain, meaning lively ground that has left many trainers reluctant to risk their high-profile horses. So it was at Leopardstown, where the annual four-day festive fare was blighted by graded races much less competitive than usual. The one glaring exception was the centrepiece Gold Cup trial, the Savills Chase (formerly the Lexus), which threw up the prospect of a sizzling contest, despite the continued, frustrating absence of Cheltenham favourite PRESENTING PERCY, whose connections appear to subscribe to the same cotton-wool supplier as those of Waiting Patiently. As it turned out, the race was spoiled by a pedestrian gallop, helping David Mullins to cleverly dictate from the front on his uncle Willie’s youngster KEMBOY. Talented though the 7yo undoubtedly is, the jockey himself poured scorn on the reliability of the form, and for Gold Cup purposes, I would prefer to concentrate on the performance of another Mullins charge, BELLSHILL, who produced a most pleasing seasonal debut under Ruby Walsh. Had the 9yo gone into the race with a run under his belt, I am sure Walsh would have taken the bull by the horns and injected some tempo to the contest himself. Expect an even better display next time, en route to Prestbury Park. Incidentally, trainer Mullins took the wraps off another Gold Cup candidate over Christmas in AL BOUM PHOTO, who won on his seasonal bow at Tramore, and I am becoming increasingly confident that this could be the year the master trainer breaks his Blue Riband duck at the Festival. As for the two chief Gigginstown hopes to contest the Savills, ROAD TO RESPECT probably did well to finish as close as he did in third considering he twice stumbled approaching the home turn and was also given a disappointingly misjudged hold-up ride, while SHATTERED LOVE confirmed that she must have plenty of juice in the ground. Gigginstown horses were the other two headline-makers at Leopardstown, with the world and his partner seemingly ready to offer advice concerning the futures of APPLE’S JADE and SAMCRO. The eulogising of the mare on the dear-departed At The Races went way over the top after she had been left with a simple task in the Christmas Hurdle by the fall of FAUGHEEN. Yes, she has now reeled off a hat-trick this term, but she continues to jump out to her right and her comprehensive defeats at Cheltenham and Punchestown last season remain fresh in the memory. Suggestions that, at this year’s Festival, she should tackle the Champion Hurdle are deservedly treated with disdain by connections. After all, she has never suggested she has the speed for the race and was even turned over by Irving in the Fighting Fifth of 2016. Trainer Gordon Elliott hints he’d favour a tilt at the Stayers’, rather than a third crack at the Mares’. As for Samcro, his decline is fast turning into a comical soap-opera after a third defeat of the campaign in the Ryanair Hurdle. Even though it left his Champion Hurdle aspirations in tatters, supporters were still trying to defend a reputation built on his progress in Bumpers and novice hurdles, so it was refreshing to hear Gigginstown boss Michael O’Leary add some stark reality to the debate after he had limped home fifth at Leopardstown. Considering Samcro has been on the go now since October, I would be surprised if tests on him found anything untoward. It appears, quite simply, that he is not as good as many thought, certainly over timber. By the way, in the same race, I was just as disappointed by my own particular Champion Hurdle fancy, MELON, on his first outing of the campaign. OK, he made an error at a key stage, but he would have to improve massively on his next appearance to convince me he can turn the tables on Buveur D’Air from last March. The contest was won by Melon’s stablemate SHARJAH, who boasts a striking turn of foot on decent ground but lacks the overall profile of a Festival champion. Similar comments apply to another Mullins hurdler, ARAMON, who landed the meeting’s 2m Grade One novice, but I am warming to the case of Joseph O’Brien’s LE RICHEBOURG, who advertised his Arkle credentials by lowering the colours of Mengli Khan in the 2m Grade One Novices’ Chase. I read somewhere that DELTA WORK turned the 3m Grade One Novices’ Chase “into a procession”. He did no such thing, which would be a worry, ahead of the RSA at the Festival, given that it was an unbelievably weak renewal. FOOTPAD was expected to turn the 2m Grade One Chase into a procession, but jumped a bit big for my liking and is beginning to look as if his spectacular exploits of last term owed a lot to the considerable ease in the ground. On a more positive note, and with the Triumph Hurdle in mind, I felt that SIR EREC and TIGER TAP TAP emerged as two of the best 3yos we have seen so far. Unusually orthodox ground and weather for Welsh racing’s biggest day of the year helped to produce its best-quality action for many moons, spearheaded by victory in the Coral-sponsored National itself by the heavily punted favourite, ELEGANT ESCAPE. Well handicapped Colin Tizzard’s 7yo might have been, but it’s rare for the winner to come from the Ladbrokes Trophy (formerly the Hennessy), given that the Newbury race is such a gruelling affair. Indeed the Ladbrokes has already claimed Tizzard’s winner, SIZING TENNESSEE, who has been ruled out for the rest of the season with leg problems. Where Elegant Escape goes next could present another dilemma for the trainer. He has been bumped up to a mark of 159, which would probably make the Grand National too exacting, and I doubt that he has the requisite tactical pace to have a say in the Gold Cup. All too often, the Welsh National’s main support feature, the Finale Juvenile Hurdle, is a Grade One in name only. But I am sure the duo who fought out a thrilling finish, QUEL DESTIN and ADJALI, are proper Grade One performers. The winning displays of YALLTARI in the handicap chase, PRESENT VALUE in the maiden hurdle and ASK FOR GLORY in the Bumper are well worth catching up with too. The Saturday between Christmas and the New Year is now a permanent fixture for this oft-informative and entertaining card. The Grade One Challow Novices’ Hurdle itself can sometimes be a letdown, and also boasts a poor record in producing Cheltenham Festival winners. But this year’s race looked well above average and, despite an unsatisfactory gallop, I’ll be amazed if all of the front four, CHAMP, GETAWAY TRUMP, KATESON and BREWIN’UPASTORM, do not establish themselves as top-drawer material. As on his seasonal bow, Nicky Henderson’s winner powered home even though he spent most of the race pulling for his head, while the improvement, from race to race, that Paul Nicholls in inducing from the runner-up is remarkable. Kateson is a lovely, likeable grey stayer for whom the Albert Bartlett at the Festival could be tailormade. It’s not often that the first major card of the year fails to deliver the goods -- and this one was no exception. From LOSTINTRANSLATION’s rousing rally to beat DEFI DU SEUIL in a high-class Dipper Novices’ Chase, the return to his best of AUX PTITS SOINS, the front-running, weight-defying heroics of ASO and the arrival of a new potential star in MIDNIGHT SHADOW, the day was richly enjoyable. The former two are likely to lock horns again in the JLT Chase in March, when the 2017 Triumph hero Defi will not have to concede the same 3lbs to his rival, while Aux Ptits Soins, winner of the 2015 Coral Cup, and Midnight Shadow could well clash in the Stayers’ Hurdle. The manner in which Sue Smith’s 6yo bridged the gap from handicap company to take the Grade Two Relkeel Hurdle was most taking. The 2m4f looked ideal and it might be worth waiting for the Aintree Hurdle over a similar trip for his crack at Grade One spoils. Aintree might also be the next call for Tom Lacey’s GLORY AND FORTUNE, who rounded off the afternoon by beating previous winners off level weights on an impressive racecourse debut in the Bumper.